Welcome to the marina cost approach. Want to know something funny? I hope it isn’t there! I’ll write a blog about this in the future, but let’s just say that I don’t believe it to be reliable. Still, the focus here is on reviewing a cost approach, so I intend to give you the benefit of some inside knowledge along the way. I won’t spend much time on this. I posted a long blog series on problems associated with determining what is buildable marina land and what is not. 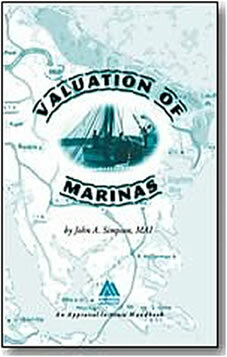 When I see land value in a marina appraisal, the thing that stands out most is highest and best use. That may sound strange, but how many approved marina land sales are there? If you spend years getting approvals (I’m not referring to inland marinas that don’t have as many issues) and hundreds of thousands of dollars, you’re not about to turn around and sell the site. So appraisers use sales of sites that typically are not approved. The red flag is what happened after the sale? If no marina was built, the buyer bought it with a different highest and best use intention. Since land frequently represents the majority of value in a marina, issues like these are too critical to overlook. So land aside, let’s look at the replacement cost new of the improvements. Buildings are easy, especially since they tend to be rather plain and generic. Cost manuals are good indicators. When we get to the docks, however, we run into problems. Did the appraiser actually measure the length of the docks? You need that number correct to use cost services. How about the bulkhead? Same issue. Personally, I like to see replacement cost estimates from local developers for bulkheads because cost manuals are inadequate in this respect (and others when it comes to a marina… but that’s a different post). This especially applies when there is unionized labor in an area. I’d like to let one secret that marina design and engineering firms know out of the bag. For appraisers that like to use a cost service to estimate the cost new of docks, this will come as a rather rude surprise. You can’t use a cost service to get an accurate estimate of dock replacement cost new. I have numerous emails in my Inbox folders that all say it’s a joke. Why you ask? Think about it like this. How many new marinas have been built in the last five or ten years? Given so few, do you really believe that the numbers quoted in a cost service can be based on bid and construction costs? Do you think a marina owner or design, construction and engineering firm would just give out those numbers? Simply put, the sample size is way too low to be reliable. For many states, I doubt that their cost numbers are even based on a single real cost estimate because I am hard pressed to find even one new marina built in that state. ‘Nuff said. Depreciation is typically calculated using the age-life method. If a dock is estimated to last, say, 30 years, and it was installed five years ago, depreciation is 5/30 or 16.67 percent using age-life. Hopefully there is some support for the useful life of the docks and pilings. You can probably guess that I believe functional obsolescence is not given enough consideration. Do you think that a brand new 50-amp single outlet electrical system is obsolete? In most markets, you bet (most boaters want doubles, not singles). How about the fixed docks that are designed for 30 foot boats when the market has gone to 35 or 40? I think I’ll shorten the short list. Entrepreneurial profit needs to make sense too. Too often ten percent is used. Maybe that’s OK, maybe not. Since marinas are not built at the same rate as other properties, who’s to say ten percent is correct? As a reviewer, we’re forced to live with whatever is put into the line item. You’re Not Telling Me What You Told Me! So far I’ve been pretty basic with some criticisms of the cost approach and explanations for how parts of the cost approach are typically put together. Now for some rocket science. Please fasten your seat belts. There’s something built into the cost approach that’s being overlooked. It’s the test of reasonableness and we can reverse engineer it. Let me illustrate. Let’s say the marina has a market value via the cost approach of $4 million. The financial statements show an average operating expense ratio of 60 percent. The marina is 95 percent occupied. The debt service ratio (also called the debt service coverage ratio) is 1.25 and the loan to value ratio is 75 percent. Other mortgage terms are a 6.50 percent interest rate and a 25 year amortization based on monthly payments. There are 80 slips, which translates into a market value of $50,000 per slip using the cost approach. We have a basic marina without any major businesses (repair, dealerships or restaurants). Let’s solve for the variable x, which is the slip rental rate. The definition of market value “presumes a transfer of the property”, so it’s safe to say that financing is necessary and required. With a $4 million market value and a 75 percent loan-to-value ratio, $3 million would be financing and $1 million would be put down as equity. Using the interest rate and amortization period above, the monthly mortgage payment on a $3 million loan is $20,256.21 or $243,074.58 annually. So far so good. The Debt Service Ratio is Net Operating Income divided by Total Debt Service. We know the Debt Service Ratio and Total Debt Service, but not Net Operating Income. To solve for Net Operating Income, we divide both sides by Total Debt Service, so the result is that Net Operating Income equals the Debt Service Ratio times Total Debt Service. Doing the math, 1.2 is multiplied by $243,074.58, so that means that the marina must generate a net operating income of $291,689.50. Since we know the marina has a 60 percent operating expense ratio, dividing the net operating income, $291,689.50, by 0.60 equals an effective gross income of $486,149.16. But this represents only a 95 percent occupancy rate, so dividing $486,149.16 by 0.95 equals a gross income of $511,736. Since there are 80 slips, the rental rate is $6,397 per slip annually. If marina slip rates in the market are not at least $6,397 per slip, the Cost Approach is wrong! If you’ve done a competitive survey, look at your ranking grid showing slip rates, occupancy and features. Where would $6,397 per slip fall? If it prices the marina out of the market or it equates to a mix of amenities and characteristics of superior marinas, the cost approach is wrong! What you are saying is that boaters are willing to pay more for less because they will not go to the superior marinas for the same amount of money yet fewer services. Ouch. I’ve tried not to take this too far. I’ve only used information that would be freely available for the appraiser from the financial markets and what management would provide. If you had a market cap rate, you could do mostly the same type of calculation and determine the sale price per slip and check that against sales. Once again, arraying your sales by features using price per slip as the unit of measure and then placing your concluded sale price in that range will tell you if the sales comparison confirms or denies your cost approach calculation. The cost approach should not be plug-and-play. There are relationships in there that you can use to determine if the value indication makes sense in the market. So now that I’ve given you one of my secrets, I’ll give you another. I just love playing with numbers from built-in relationships. They give me so much fun on the witness stand! 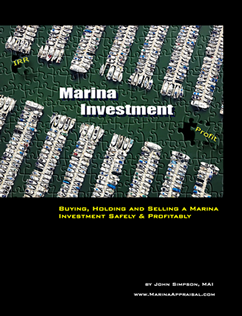 Part 7 of this series will address reviewing marina sales comparison approaches.